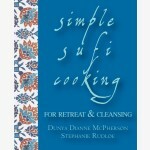 View Cart "Simple Sufi Cooking" was successfully added to your cart. Dunya’s rich account of life in the body takes dance beyond performance…into the dynamic realm where the physical, emotional and spiritual powerfully intertwine. This rich account of life in the body takes dance beyond performance into the dynamic realm where the physical, emotional and spiritual powerfully intertwine. Dunya’s intense passion for dance took her from a small seaside New England town in 1972 to the Juilliard School in the heart of NYC’s vibrant, edgy art scene. When a serious injury derailed her burgeoning career ten years later, she sought ways to heal her body and revise her future. Retreat in a monastic mountaintop community directed by a charismatic Iraqi Sufi Master, proved to be a sojourn that ultimately led her to the development of Dancemeditation. Special benefit price: $14.50 (Purchase here benefits the Dervish Society of America, a tax-exempt nonprofit organization supporting the path of Dancemeditation™. Regular price: $18.95) Your purchase of items and events through the Shop is tax-deductible. Your payment benefits Dervish Society of America, a nonprofit 501-C3 tax-exempt organization supporting the activities of Dancemeditation™.